Sometimes you just want a pasta without red sauce. That was where I found myself when I made these awesome turkey meatballs last week. I wanted a pasta that was lighter but still could stand up to the meatballs. So I came up with this recipe. I love artichokes and I also love eggs, so this is the perfect eggy artichokey marriage. This is also very fresh tasting because I throw in raw tomatoes at the end. And some fresh herbs are making an appearance as well. This is perfect for summertime because it's lighter. I served it family style. This would be awesome al fresco, don't you think??? Preferably with some very dry rose wine! I'm a prep master, and it comes in handy for this dish because at the end, it all comes together really fast! 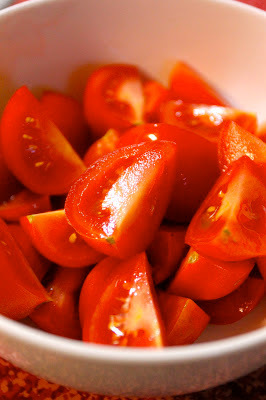 Here I quartered 8 campari tomatoes, and I set those aside. As for my artichokes, I took a 6.5 ounce jar of marinated artichokes and put them in the food processor until I got this consistency. 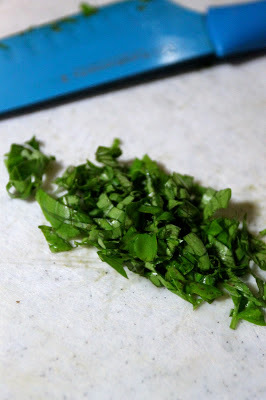 Then I chopped some fresh basil from my garden, about six fresh leaves. YUM! They smell great. Too bad your computer isn't scratch and sniff. Now, in a small saucepan we're going to get the sauce started. There isn't much too it, but getting it done ahead of the pasta will save you time and heartache in the end when, like, I said, this is gonna go FAST! 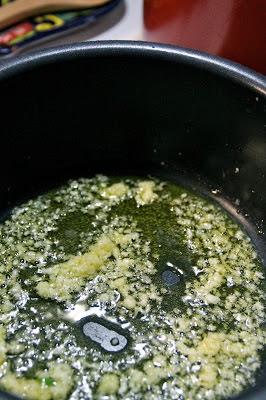 So in your saucepan, add two tablespoons of olive oil and 3 cloves of minced garlic. Cook for two minutes and let the garlic get nice and toasty. And a couple of tablespoons of olive oil more. 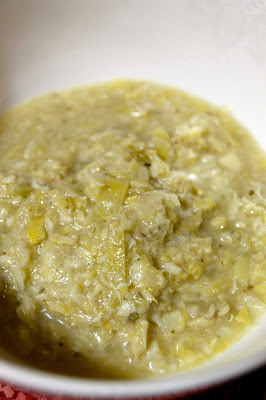 Reduce heat and let it simmer. Now, in a pot of salted water, add your pasta. Cook according to manufacturer's directions. 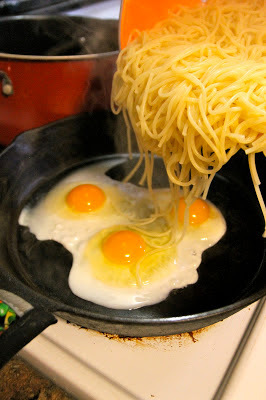 When the pasta is ready, heat a heavy skillet over medium high heat and crack three eggs into the pan. Well, I did it in a bowl and then just threw them. Whatever works. 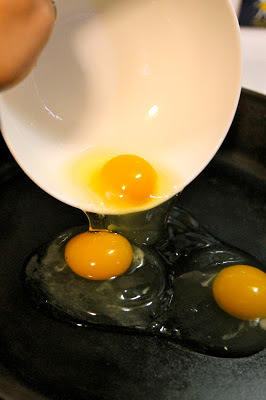 When your eggs look like this, throw your hot, drained pasta right into your eggs. Mix it up really well (I like to use tongs) and then return the pasta/egg mixture back into the pasta pot. Mix it up with your tongs, and salt and pepper this beautiful plate of pasta!!! I served mine family style alongside my turkey meatballs! YUM! First prep your tomatoes and artichokes; quarter the tomatoes and set them aside. In a food processor, add your jar (juice of all) of artichokes. Process and set aside. In a small saucepan, add two tablespoons of olive oil. Heat over medium high heat and add your three cloves of minced garlic. Cook over medium high heat for two minutes. 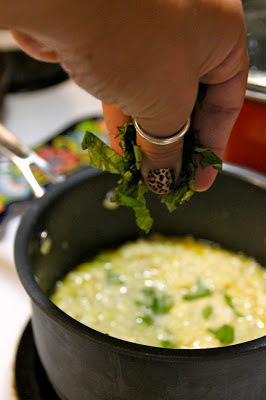 Add artichokes, basil and two more tablespoons of olive oil. Reduce heat and simmer until everything else is ready. 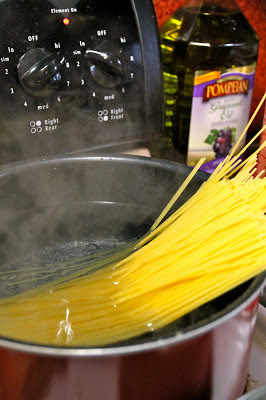 Add your pound of pasta to your salted, boiling water. Cook according to manufacturer's directions. Drain when the pasta is cooked. 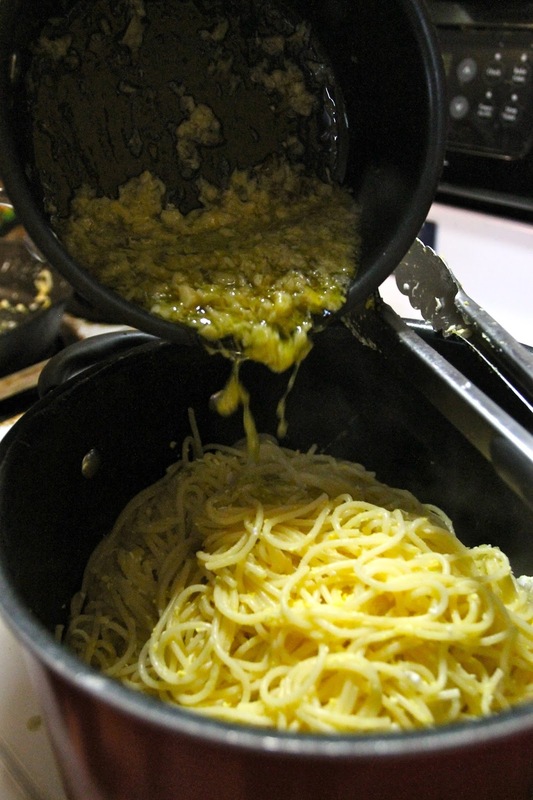 When the pasta is done, heat a heavy skillet over medium high heat. Add your three eggs to the pan. 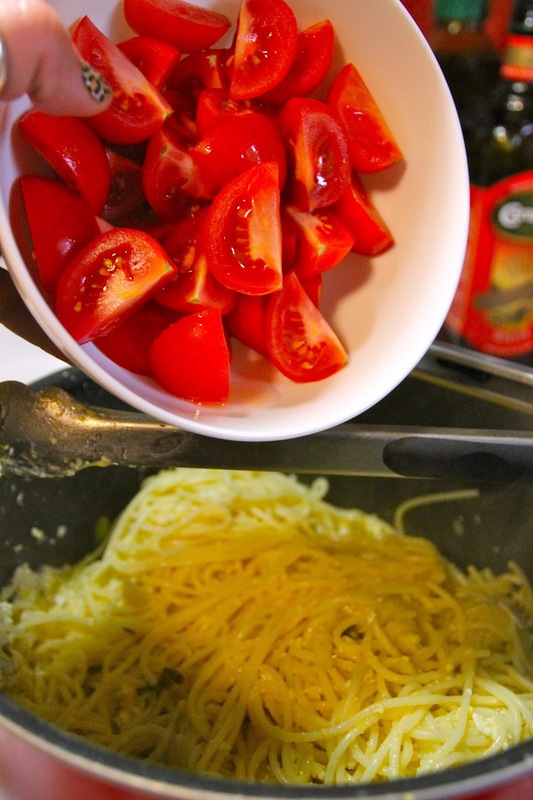 When the whites of the eggs are looking cooked, add your hot, drained pasta to the eggs. Turn off the heat on the burner. Add your artichoke sauce and stir with the tongs. Add the fresh tomatoes and stir again. 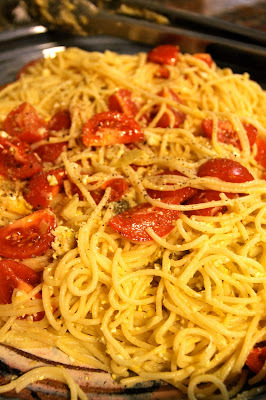 Place the pasta in a serving platter. Salt and pepper. Serve family style!! !